President Donald Trump, Tell Bibi; U.S. Wont' Start War With Iran. 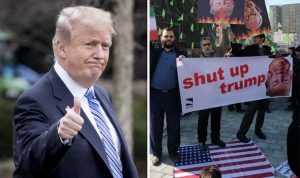 You are here: Home / News / President Donald Trump, Tell Bibi; U.S. Wont’ Start War With Iran. President Donald Trump, Tell Bibi; U.S. Wont’ Start War With Iran. (ThyBlackMan.com) On Monday, President Donald Trump designated the Islamic Revolutionary Guard Corps a terrorist organization, the first time the United States has designated part of another nation’s government as such a threat. Indeed, on the eve of his re-election Tuesday, Bibi promised Israelis he would begin the annexation of Jewish settlements on the West Bank. In Libya, where a U.S.-led NATO intervention overthrew Col. Gadhafi in 2011, a renegade general now controls two-thirds of the country and is mounting an assault on Tripoli. U.S. soldiers and diplomats fled the capital last week.